Looking for reliable, professional commercial and residential pest control services? Affordable Pest Control provides a comprehensive range of pest management services throughout the East Valley, including San Tan Valley, Queen Creek, Apache Junction, Gilbert, Chandler, Mesa, Tempe, Phoenix and more. Whether you are looking to protect your home or office from scorpions, cockroaches, or spiders, we have the skills and experience to get the job done right. Our team has 30 years of experience in pest management and will work with you to determine which services fit your needs and situation. Our company offers same day, one-time, monthly, and bi-monthly services to customers across the East Valley. Our service agreements provide you with an affordable way to protect your home or business from pests. We are proud to be the team customers trust to control and protect against scorpions, ants, ticks, spiders, cockroaches, millipedes, box elder bugs, crickets, black widows and other pests. In addition, we provide bed bug treatments, mosquito fogging and other services to ensure you live pest-free. We are committed to exceptional customer service and use products that are safe for you, your family, home, pets, and business. Affordable Pest Control was started in 2013 by Mike Olander with a vision to provide quality, same day pest control service to customers across San Tan Valley. He joined the local Chamber of Commerce and got involved in the community, and within 2 years, the business had grown to a point where he needed to expand. Partnering with Tony Gumm in June 2015, Affordable Pest Control now serves not only San Tan Valley, but much of Arizona. 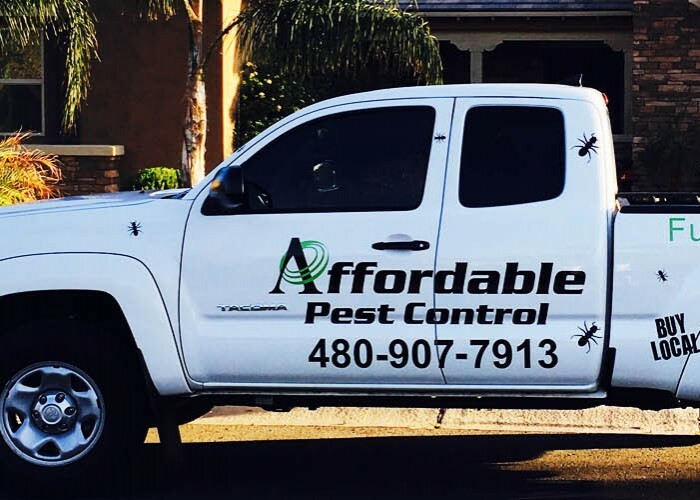 Affordable Pest Control has a fleet of seven vehicles to serve the East Valley, They attribute their growth to their true commitment to customer service, and dedication to using only the best products and methods to control the many pests found in Arizona communities.